Sonic Music likes to reach for the music of the sounds and the sonic beeing in music. Playing many instruments himself(flutes, saxes, guitars, keyboards, percussion, musical saw and kazoo), mixing real instruments with virtual ones, Nicolas Vandooren will find the right way to mix your ideas into music. With 20 years of experience in writing and producing music, Nicolas has worked in many audio sectors: the record industry (Universal Music, EMI,...), the advertising world (Belgium, France, Holland, Germany, Great Britain, Ireland, Japan, USA, Denmark, Sweden, Switzerland, Italy, Greece, Hungary,...), the movie business (Belgium), for television and radio medias (Belgium and France), in videogames and theaters (USA, Belgium and France). Sonic Music has a recording studio especially dedicated for sync work with pictures and the live recording of acoustic instruments. 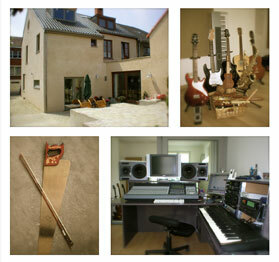 Located in a green area of south Brussels, the studio is equipped with Pro-Tools HD3, a Sony DMX-R100 digital mixing board, broadband access and FTP facilities, many real instruments, lots of great sounding softwares...and a well furnished kitchen and bar!